6 years…in many ways it seems a life time ago and it is. So much has changed and yet this day is one I will always stop and reflect on the life and death of our first daughter Lily. I think of how different our family might be if she had lived and how she never would have existed if Knox had lived. How we could be celebrating the 6th birthday of a son or the half birthday of a daughter who would be 6 in November. I think about how much I have learned from that experience and the 6 years since. How it grew my faith and understanding of God’s sovereignty. It changed how I care for others. Today as I turn 29 weeks, expecting our 2nd daughter in August, I think about the blessing of being a mother who has experienced tremendous grief at the loss of a child and who also knows the joy of welcoming a new baby to the family. 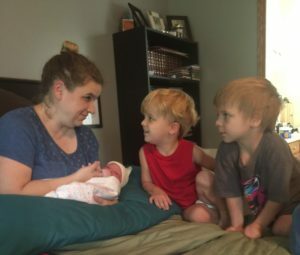 We’ve talked about names and how we will honor her memory in the birth of this child, just as we did for Knox when Zeb (Zebediah Knox) was born. We pray that God will lead us to choose the right way to do so without minimizing Lily’s life or her importance in our family. I’d be lying if I said I wasn’t a little bit anxious as I prepare for her birth. Fear that maybe I won’t be able to hold a little girl at the end of all of this. You see, that’s the crazy thing about grief and losing a baby…you’re never quite sure when it’s “safe” to let your guard down. I’ve never longed for a daughter like some mothers do, my boys are pretty amazing to be honest. But losing a baby changes your perspective…I don’t care whether I have a daughter or son…instead I long for a live baby. 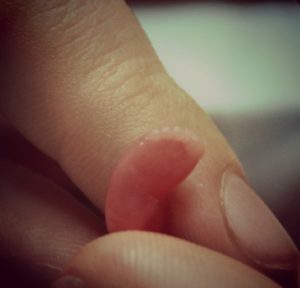 A baby who takes it’s first breath and cries beautiful cries. Who looks at the world with wide eyes and hears her brothers and parents celebrate her birth. So I pray…I pray for her safety, her life and that whatever happens God will use me in the way He sees fit. I pray that I will surrender to what God has in store. That if He grants me the beautiful privilege of a daughter I will be the mother I need to be for her. That she will grow to love Him and others. Six years ago, we said hello and goodbye on the same day. We held her for the first time and the last time. We didn’t forget, we won’t ever forget. But we are thankful for her and the way she touched our lives and taught us much about the treasure of life. Things have been quiet on the blogging front for the last few years. As I hope to ease back into posting regularly, I thought you might like a little update about what’s been going on with our family. In a nutshell, life is busy. Life with 7 boys is busy. Life homeschooling 7 boys, raising goats and chickens, and working full time is busy. I wouldn’t have it any other way. Our boys are 15, 13, 9,7,4 (almost 5), 3, and 16 months. There is always something going on here! I recently had the opportunity for all of them to visit Grandma’s house for a day while I worked. It was harder than I expected to concentrate without the normal background noise I’m used to. This last week we had our 20 week sonogram for baby #8. The boys were excited to find out the gender of this little one. A couple of the boys have been wishing for a sister and a couple of them were really hoping for another boy. They wanted to do egg roulette as a gender reveal. If you’re not familiar with the concept, we boiled 17 eggs and left 1 raw. We dyed half the eggs blue and half pink. The color of the raw egg represented the gender of the baby. Then each boy took a turn smashing the egg on his head to see who got the ‘lucky’ egg. Here’s the video we shot of the gender reveal…this is truly what’s it is like to live at our house. 🙂 Enjoy! Four years ago today I had one of the most amazing and rewarding experiences of my life. 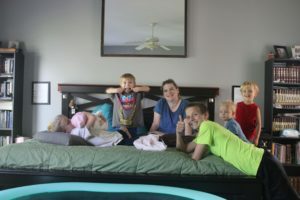 I had an awesome homebirth. It was what I needed to heal from some less than ideal birth experiences. It was my first VBAC after 3 c-sections. For those who haven’t heard or read the story, I’ve posted it below the pictures. Titus has been such a blessing to our family. He is challenging some days with his strong opinions and preferences but he is oh so wonderful in our family. He has a stubborn streak a mile wide but he also loves and cares so deeply for those around him. I look back at the day he was born and am so thankful for the prayers God answered that day. We continually praise Him for the blessings He’s given us and His provision. We are thankful that God allowed Titus to be born at home (something we prayed for daily from the day we found out we were pregnant) and so thankful that we have been blessed with 5 happy healthy boys. Below are a couple pictures from the day he was born and the days following and some more recent pictures too. They were amazingly chipper and happy for being up so late the night before. Both Gabe and Otto stayed up until about 2am to watch Titus get checked over by our midwife. Otto couldn’t keep his hands off of his baby brother. We watched the video recently and could hear ourselves asking him to move because his head or his hand was in the way of trying to do the assessment. Zeke was the only one that night who got a good night sleep. The next morning our birth photographer came to take pictures of our new little addition. He seems so little looking back. We loved getting to know all of his little features as a family. There is just something about a newborn baby that begs to be touched, held, kissed and loved. He really enjoys waffles for breakfast. Because what boy could resist mud? When I became pregnant with Titus, I wanted a different outcome and began researching my options and the current research regarding having a 4th c-section to having a VBAMC (VBAmultipleC). The research is limited, but what there is shows that even VBAMC are relatively safe and the risk of uterine rupture (which is the big fear with VBAC) is still less than 1-2%. The current culture in the hospital is not VBAC friendly even after 1 c/s and is definitely not friendly after 2 or more. So I began researching a homebirth with a midwife, discussing options and research with Kerry and covering each decision with lots of prayer. I would encourage any woman to do her research and pray before making her birth choices. There is a lot more support for VBAC there than some would have you believe. We found a midwife , who was also a believer,willing to take me as a client and began our journey. My pregnancy, like all of them, was uneventful and pretty normal. As part of my care, I saw a chiropractor once a month to help align my pelvis and spine and help position baby correctly. One of the reasons I had a c/s with Gabe was because he was malpositioned, so I wanted to avoid that if at all possible. I laid down on the couch to get some rest, and had one really big contraction that was quite uncomfortable. But the next couple were manageable again. Mom suggested I put a towel under me “in case my water broke”, I was sure that wasn’t going to happen, but though I would humor her anyway. (I was glad for the suggestion, as with the next contraction that’s exactly what happened). My water broke about 10:30 and that’s when things got “fun”. Kerry called the midwife to let her know and she said she’d head down. Kerry and I came upstairs to fill the pool (we had set up a little pool in our bedroom for me to labor in) and my contractions started coming much much faster and stronger. Mom and the big boys (Zeke was asleep) were downstairs watching a movie and had no idea things had really picked up. I spent about 30 minutes in the pool and then walked to the bathroom. Once I was there my contractions were so intense and my mind was racing. Kerry says I was really pretty calm, but in my mind I was going nuts. At one point I told Kerry “I’m hysterical….I can’t be hysterical”. He said later he didn’t know what I was talking about as I was barely saying anything and appeared really calm to him. He wasn’t (at least he didn’t act like it) scared or panicked at all. About 10:15 I felt my body pushing and I couldn’t stop. In my head I was sure I wasn’t ready to push and was worried I was going to do something that would make my labor go longer. A year ago today (5/19) our daughter Lily was born. She was born on our son Knox’s due date. We said goodbye to two babies in 6 months. I remember when we got pregnant with her that surely(surely!) God wouldn’t ask us to go through the grief of losing another baby. When we were given her diagnosis, I was sure she was going to be the 1% that survived. But she didn’t and she was born on the day our son should have been born. So much has happened in the last year and a half. We’ve said goodbye to two children and welcomed a new one to our family. Time has softened the grief a bit, but it’s still there under the surface. While I was pregnant with Zeb, I struggled with fear. I struggled to embrace and delight in the pregnancy because I *knew* that God could ask me to grieve another child. There is no promise that He won’t again. But I trusted that whatever He chose for us would be the best that He had for our family…even if we don’t always understand it. The morning Zeb was born all I could do was sit there and hold him praising God for the safe arrival of our baby. That I was holding him in my arms without grieving…but yet part of me did in a way. One child doesn’t replace another. Lily didn’t replace Knox and Zeb doesn’t replace either of them. I still grieve the loss of our babies, I hurt deeply. I still have days where I’ll see an outfit and it will give me pause. It reminds me of a daughter I don’t get to hold here. I’ll see a hat or pair of shoes and I’m taken for a moment to the place where I know that a little girl is missing in our lives. I see Zeb and wonder if Knox would look as much like his brothers as Zeb does. I wonder if Knox would share the same bent pinky or one sided dimple with his brothers. I trust that one day I will know. What a marvelous day it will be to meet my children for the first time in Heaven. But I am thankful. I am thankful…even as my heart still heals. While I grieve (yes still), I can minister. God has taught me and grown me. He has knit our family together tighter than before. He has blessed me with opportunity to share His love with others because of what He’s called me to go through. I am thankful too, for the healthy baby I have in arms tonight. 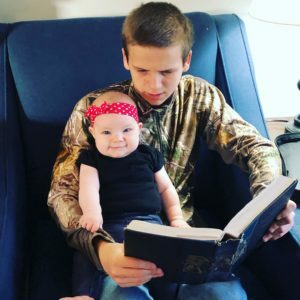 While we have always viewed children as blessings and we have desired them…the true meaning of that blessing I think would, in some ways, be lost had we not been through losing Knox and Lily. I can truly say that while I am exhausted some mornings, I am so very thankful to have a baby to wake up with during the night. When I was pregnant, I would give thanks for every push and pull when he would move, when I was in labor I praised God for every contraction and now that Zeb is here…I am grateful for every late night feeding and early morning diaper change. We all are. Lily is not forgotten today, on this day…her birthday. Knox is not forgotten on this day…his due date. They are remembered every day. We talk about them and we have reminders of their special little lives in our home. Knox’s footprints hang in our hallway, Lily’s pictures are in our photo album and they are remembered and loved. They are part of our family. We remember and are thankful.